Players must first complete the quest, Beasts of Fable, before unlocking the daily quest of the same name. The initial quest rewards the Red Panda. The Fabled Pandaren Pet Supplies is a reward for completing the daily. This bag also has a chance to drop two other panda companions—Snowy Panda and Mountain Panda. 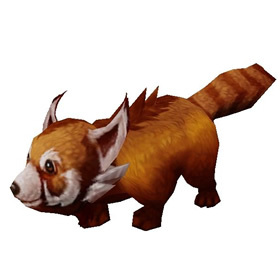 While I can see this pet as a long winded survivor by using Cute Face and Crouch. Scratch isn't Flurry so you can't get past shields with multiple hits. However, sunlight and hibernate might be an interesting combination to try. I can imagine Sunlight, scratch 2-3 times, hibernate back up, then repeat. The problem is the 5 round cd with hibernate. I find it odd that they would put such a long cd on something that is a come-hit-me move. Truly solid tanking pet. Bonus with Scratch that is strong versus Undead. 289 speed to make good use of Crouch, and Hibernate to heal up. I guess Sunlight can make Hibernate heal for alot and huge healtpool but I still feel Crouch is more useful. Good pet that is hard to fail with. Had this drop on only my 7th pet supplies. Much as I love this pet, I'm fed up of seeing him drop from my bags - I've got 5 now, not including the one I kept :( Tried selling them on the AH, but no-one wants to buy (trying to sell at 2000 each, as I need the gold to buy pets I can't otherwise get). Will drop the price and see if they sell. I was exceedingly lucky and got this little guy after completing the quest for the very first time. I'm in love with his fur color and I have to say, he's the best looking of the 4 new Pandas. They are cageable, I saw one on the auction house for 70k. That is what brought me here to find out how rare they are. Can you put these pets in cages and sell them? Got mine yesterday in the Fabled pet bag. LOVE HIM! These cuddly rascals enjoy basking in the sun, sleeping in the sun, and napping in the sun.